Looking at this photograph taken in 1918, one can’t help but notice two things: First, a smiling subject, as opposed to the usual stoic stare that haunts the frames of most old photographs. Second, a woman behind the wheel of a racecar. Both surprising factors paint an accurate portrait of Nina Vitagliano, a vibrant woman who loved to race and was far from bashful about it. In 1918, it was unusual for a woman to even drive, let alone pilot a racecar—women had been banned from official motorsport competition since 1909, and to think a woman could race against a man was scandalous. But Nina was free-spirited and ambitious, not to mention experienced: She raced cars in her motherland of Italy and had no intention of stopping just because America was behind the curve on women’s rights. After debuting her racing skills on the first all-women’s track race at Ascot Park in Los Angeles, Nina and her fellow “Speederettes”—as the media dubbed the group of racing women—made their way to Stockton Park, Stockton’s one-mile dirt track, to showcase their skills at the “World Championship” for female drivers. Rival racer Ruth Wightman had challenged Nina to a rematch at the Championship, which Nina delightedly accepted. Attracting over 10,000 spectators, this event called for greater horsepower than the small stock cars and cyclecars the Speederettes had been working with; promoters decided it would be more exciting if the women drove the cars of well-known male racers. Nina was given the legendary Earl Cooper’s #8 Stutz. The first race was a single-lap sprint, which Nina won. The second was a five-lap contest. Nina and the Speederettes full-throttled down the dirt track, skidded, tires screeching around each turn, kicking up billowing clouds of dust. Ruth held the lead from the beginning and was gaining speed. Undeterred, Nina gave the throttle all she had and attempted to pass Ruth while converging with a turn. Then, tragedy struck. The famous Stutz blew a tire and Nina lost control. In a horrific crash, the car bounced over the embankment, collided with a tree and fence, and rolled to a stop. Both Nina and her co-pilot lost their lives. Mourned and remembered by both Stockton and Los Angeles’ Italian-American community as their courageous champion, the fearless Nina Vitagliano left a legacy of female ambition in her wake. 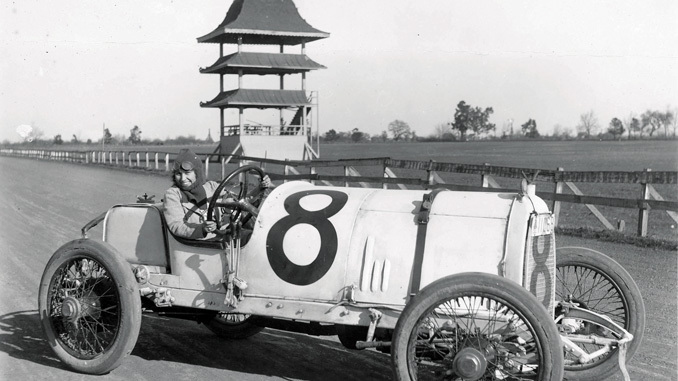 Though her passing dissolved the Speederettes, the group’s trailblazing efforts in breaking the gender barrier of the sport inspired many women to pursue racing in the 1920s and beyond.